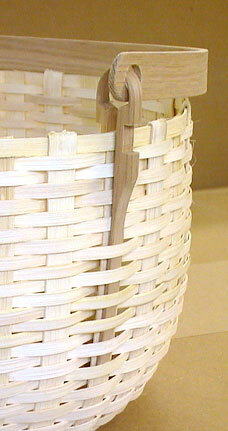 In South Central Kentucky the rib construction basket is commonly called the Egg Basket. 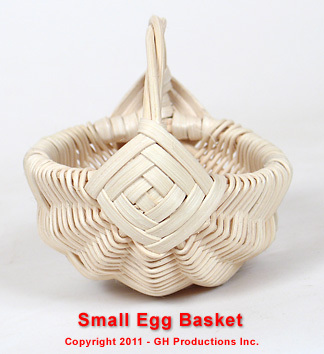 The egg basket is not difficult to make. There are only 4 basic parts: The hoops, the lashing or "eye", the ribs and the weaving. In this pattern the hoops are made from #5 round reed as are the ribs. 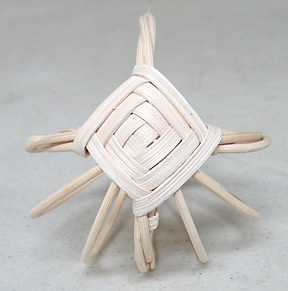 The "eye" is a God's Eye using 3/16" flat reed. And the weaving is #2 round reed. 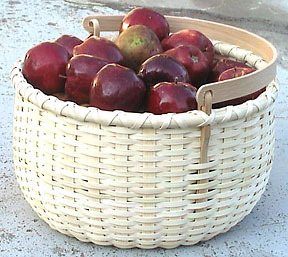 This little basket would make a lovely holiday decoration and would be fun to make with your friends. Enjoy! Calculate Supplies for 1 to 20 Small Egg Basket baskets with the Basket Supply Calculator. The Supply List gives you the least expensive way to purchase the supplies for your quantity of baskets. View on-line or print to your printer. *This item has been rounded to 1 pound because it is less expensive to purchase 1 pound than to purchase the foot quantity. 1 pound of #2 Round Reed is enough for about 20 of these 4" Egg Baskets. Check the pattern for soaking times for your reed. 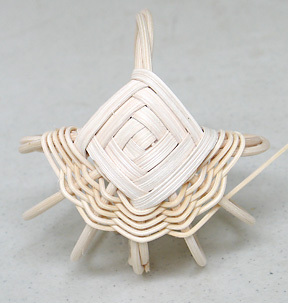 If reed becomes dry while you are weaving, dip it in water for a few seconds. 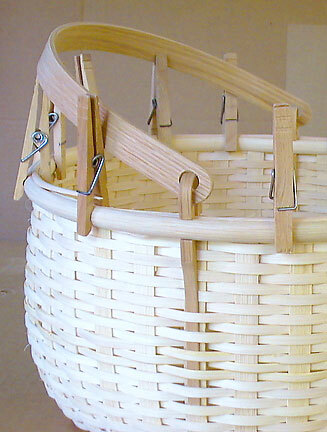 As you weave, gently push or pull on the ribs so your basket has a pleasing shape. Soak your #5 Round Reed for 5 to 10 minutes. Make a circle about 4 inches in diameter. 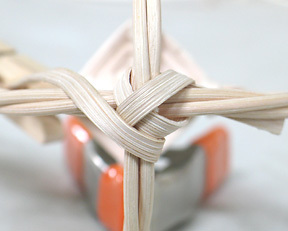 Form an overhand knot by bringing the long end of the reed from outside the circle, into the circle and out again. Continue this process of bringing the long end of the reed into the circle and out again. Pull each "stitch" snug and let it rest in place over a 3 or 4 inch span. Repeat until you have three rows of reed forming a 4 inch circle. Make another hoop from the round reed slightly smaller than the first hoop. 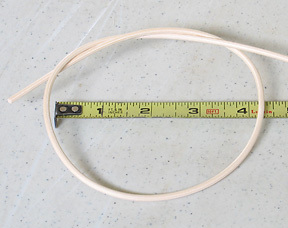 Glue the ends to keep the hoop from coming apart and then trim the ends so they make less of a bulge. Glue and trim the ends of both hoops. Place the smaller hoop inside the larger hoop at a right angle and secure with a piece of waxed linen. The larger hoop will be the handle of your basket. The hoops should cross each other at the mid points. Just before you tighten the waxed linen, slide the hoops around until they look "centered". 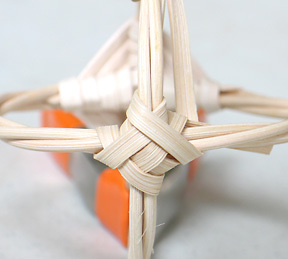 Make a God's Eye on both ends of your basket. The God's Eye holds the hoops together and holds the ribs in place. Soak your 3/16" Flat Reed for about 2 minutes. 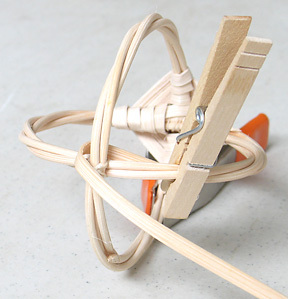 Place it behind the right hand side of the hoop and hold in place with a clothespin. Bring it behind the hoop overlap and down to the right. The smooth side of the reed should be facing outward. 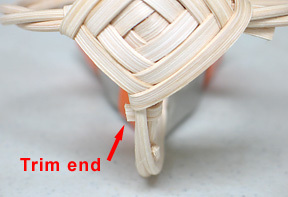 The glued and trimmed ends of the vertical hoop (the handle) are at the bottom. 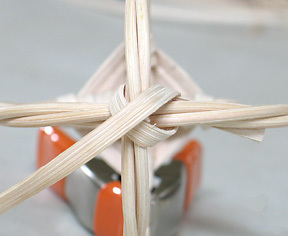 Wrap behind and around the right hand side of the hoop (securing the end of your flat reed) and cross the middle with your flat reed. Wrap behind and around the lower hoop and again cross the middle just to the left of the previous stitch. Wrap behind and around the left side of the hoop and again cross the middle just to the left of the previous stitches. Wrap behind and around the top hoop and again cross the middle just to the right of the previous stitches. Wrap behind and around the right side of the hoop and again cross the middle just to the right of the previous stitches. Continue this clockwise wrapping pattern until you have three rows on all four sides of the center stitch. End at the bottom of the handle hoop. 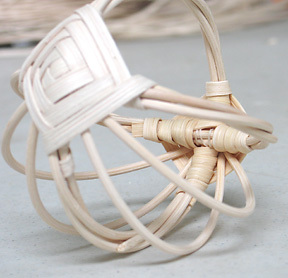 Wrap behind and around the bottom of the handle hoop and insert the end of the lashing between two pieces of the hoop's round reed. Use an awl to spread the round reed apart if needed. Pull the lashing tight and trim the end. The ribs will lay behind the God's Eye. The length of the ribs will determine the shape of your egg basket. With this basket all four ribs will be the same length. 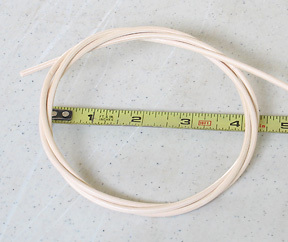 After you soak the round reed for 5 to 10 minutes, pre-bend the round reed with your hands. This will make the ribs easier to place into your basket. 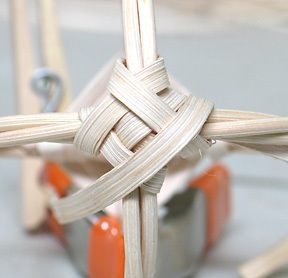 Now cut one end of the round reed at an angle and place behind the God's Eye. The end should go all the way up and touch the lashing around the hoops. 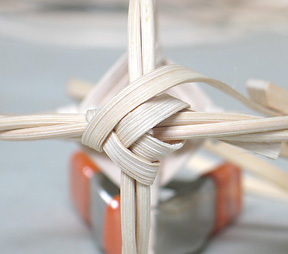 To gauge the length needed, bend the round reed around to the other end and hold in position on the outside of the God's eye until the shape looks like photos. Cut the rib a little longer than needed and test fit. The rib will lay behind the God's Eyes on each end of the basket. Adjust the length until you have your desired shape. Remember a slight angle on the end of the rib helps the rib lay behind the God's Eye and touch the lashing. TIP: Notice the ribs are slightly longer than the hoops. See Photo. Remove the rib and cut three more ribs to match its length. Angle the ends and place all four ribs in position behind the God's Eyes. The ribs should be evenly spaced. 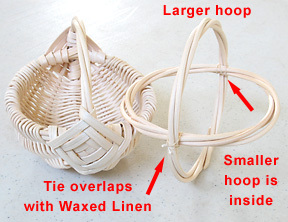 The weavers will start on opposite ends of the basket and meet in the middle. Weave over the first rib from the top and under the next rib. See Photo. TIP: The weaver will want to remain straight and push the ribs out of position. So, you will need to make sure the weaver bends over and under the ribs as you weave. Weave over the handle hoop, under the next rib, over the next rib then weave behind and over the hoop. Continue weaving back to the other side in the opposite direction. See Photo. 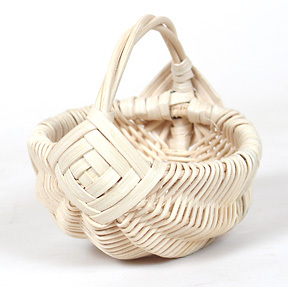 You'll be weaving the egg basket in "plain weave". This simply means over one, under one, over one, under one, etc. The rows of weaving should be close to the God's Eye. It is a little tricky to get the first row of weaving to lay exactly in place. Just try and keep the weaving even and keep your weaver wet. The rows of weaving should touch each other. After you have woven a row or two, it is possible to slide the rows toward the God's Eye so that they do touch each other. But, it is best to make sure the rows touch each other after every stitch. Yes, the ribs will pop out from the God's Eye on the opposite end of the basket. Just put them back in place or hold temporarily with clothespins and continue weaving. Some people use masking tape to temporarily hold the ribs in place. Weave 6 or 8 rows with the #2 round reed. Let the end dangle - do not cut. Again, notice that the rows are even, that they are touching each other and that the weaving lays nicely over the hoops. See Photo. Start the opposite end exactly the same way. Weave until the weaver runs out. When the weaver is just about to run out, tuck it into the previous weaving along a rib. 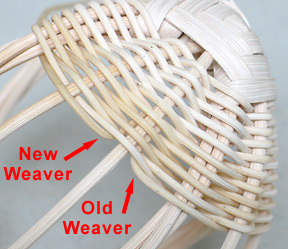 Insert a new weaver along the same rib and continue weaving. 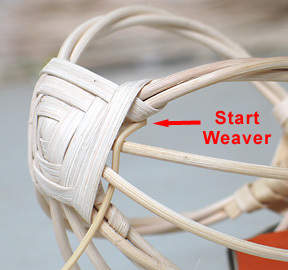 Make sure you continue the same over and under weaving pattern. 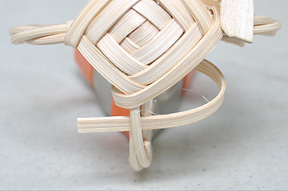 Continue to weave from each end until the weaving meets in the center of your basket. Finish the weaving like a splice. That is, tuck the ends of the weavers into the weaving along the same rib. 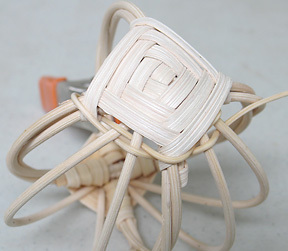 As the weaving approaches the center of the basket the remaining space left to weave may not be equal. Most likely the space over the hoop will be smaller than the space in the center. 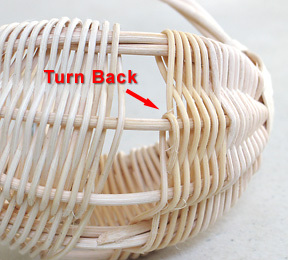 If needed add extra rows of weaving in the space by turning back before you reach the hoop. See Photo. Weave to the opposite side and turn back again before you reach the hoop. After a "normal" row or two, repeat the turn back if needed. NOTE: Do not put all your turn backs on one end of the basket. Usually one or two sets of turn backs on each end will equalize the remaining space. 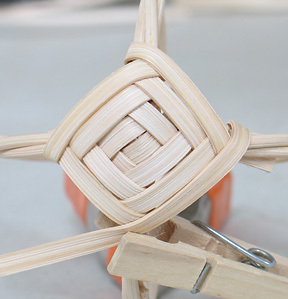 Once the space is even, keep weaving until you meet in the middle of your basket. Enjoy your Small Egg Basket!